So you've registered - what's next? Today sees the introduction of the apprenticeship levy - a new levy to underpin a reformed system in which apprenticeships are more rigorous, better structured and independently assessed. The new system will also ensure apprenticeships are more clearly aligned with the skills valued by employers. And levy-paying employers are now able to manage their apprenticeships through the apprenticeship service. While thousands of employers have already registered for the service, we’re still adding functionality. Since last week, employers can add apprentices and set up payments, as well as sign their agreement with the Education and Skills Funding Agency (formerly Skills Funding Agency). From May onwards, levy-paying employers will be able to access their funding for new apprenticeships to start. To help you prepare for the introduction of the levy, we wanted to make you aware of some new features available as part of the apprenticeship service. These will help you get set up and ready for when funds are visible in your account from May. Use our tool to get an indication of how much apprenticeship funding you’ll receive in May 2017 and estimate how much your chosen apprenticeships will cost over time. If you aren’t sure which type of apprenticeships you need, or haven’t employed apprentices before, take a quick look at our guide for employers. The Register of Apprenticeship Training Providers has now been published. You can search for and select apprenticeships and see details of approved providers who can deliver that training through Find apprenticeship training. You need to think about the job roles and career paths within your business, and which type of training might be right. You may need a traineeship pipeline into your apprenticeship programme. Look right across your organisation - traditional and new apprenticeships are available in nearly all job roles. Register securely to set up an employer account. We’ve had lots of feedback from employers about how easy and quick it is to register – it shouldn’t take more than 10 minutes. You will need your Government Gateway ID for each PAYE scheme you add to your account. If you’re a company or registered charity, you’ll also need your Companies House or charity number. It’s likely that someone in your finance or payroll team, usually the person responsible for your monthly payroll submissions, will have the Government Gateway details. You can ask them to set up the account for you if they are unable to share the details with you directly. The apprenticeship levy could mean a much wider range of people in your business need to be involved in decision making and management of apprenticeships. This could include your Chief Executive, Finance, Payroll, HR, Learning and Development teams as well as managers who will mentor apprentices in the workplace. There is no upper limit on the number of team members you can add to your account. For more help in signing up, read our blog post on 5 questions employers ask when registering for the apprenticeship service. Before you can start adding apprentices you’ll need to sign a legal agreement with the Education and Skills Funding Agency (formerly Skills Funding Agency), to authorise payment from your apprenticeship funds to to your chosen training provider. Employers can now see and sign this agreement in their apprenticeship service account. Once signed in, navigate to the ‘organisations’ section and you’ll be asked to sign an agreement for each of your organisations that will contract with training providers. Note that only super users for the account have permission to sign the agreement. Work with your training provider to post your apprenticeship vacancy online and find the right candidates for the role. Training providers can post vacancies on Recruit an apprentice on behalf of employers (candidates can view and apply for these vacancies through the Find an apprenticeship service). We’re working to make the recruitment service directly available for employers later this year. You can now get apprentices set up on the system, ready for when they start from May. You can add apprentices and set up payments to your training providers. We’ve recorded this video to take you through how the process works, and here are some common questions from employers about this part of the service. Levy will be collected from April 2017 by HM Revenue & Customs, and apprenticeship funds will start to appear in your account from May. You can use your account to view payments you’ve made to training providers and to stop or pause a payment. 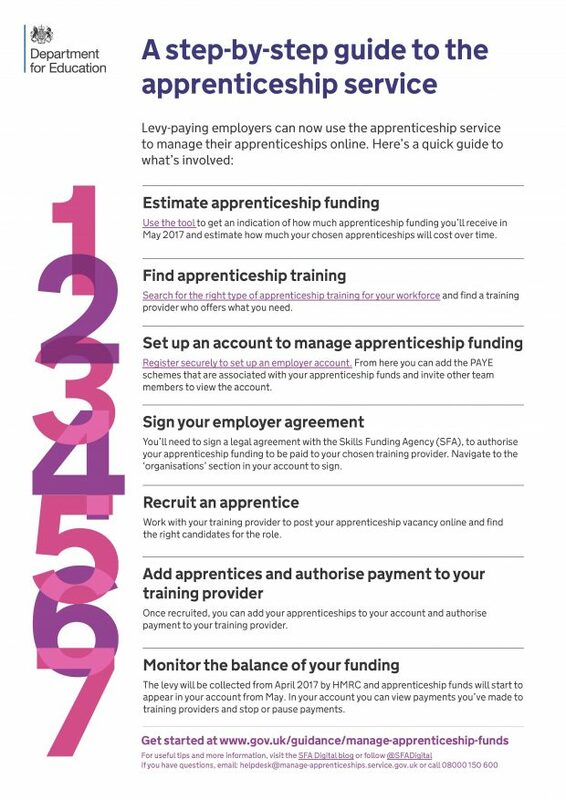 If you haven’t already, you will need to set up your apprenticeship service account to complete steps 2-7 above. Once registered, you’ll be able to see updates inside your digital account when new functionality is released. We’re also making some videos to show you how parts of the service will work. Watch this blog for regular updates, or follow @SFADigital on Twitter. If you have any questions or issues accessing the apprenticeship service, email us or call 0800 015 0600. We run a payroll bureau with over 50 clients and are having trouble registering ourselves, Teesside University. Surely we wouldn't be registering for all our clients as we are not the employer?